The Center provides essential information to the courts to advance the protection of victims of human rights violations, brings to justice those who participated in the state sanctioned terror of the Kosovo conflict, and brings public pressure on concerned citizens and nations to act on these violations. 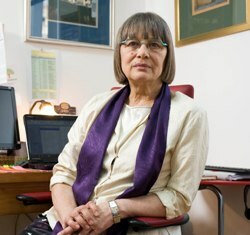 Natasa Kandic, founder of the Humanitarian Law Center. Photo HLC. Human rights organizations exist worldwide, fighting for justice against abuses wherever they occur. These organizations often face challenges and dangerous threats on a daily basis from the people they oppose, who hope to force the organizations to back down. The Humanitarian Law Center, too, faces threats from those in positions of power. But the Center and its founder, Nataša Kandić, stand firm in their dedication to justice. For years, Natasa Kandic traveled, protested, and documented the crimes and abuses perpetrated during the war in the former Yugoslavia. As a sociologist and a Serbian, Kandić felt it her duty to record and report the murders, tortures, rapes, and disappearances of her fellow Serbians; indeed, anyone who was a victim of the fighting. This was dangerous, and a challenge; her attempts to shed light on the criminals, often members of her own government, were frequently met with personal threats. But Kandic didn’t stop; in 1992, she founded the Humanitarian Law Center, recruiting a few dozen lawyers to help her prosecute the offenders. The Humanitarian Law Center (HLC) is a repository for all of the documents collected that record human rights abuses suffered during the fighting in Yugoslavia. The Center uses these documents as evidence in the courts in lawsuits against war criminals, in many cases working to remove them from positions of authority. Over the years, HLC has committed itself to working with other human rights organizations to protest abuses and continues to seek justice and reparation for the victims of war crimes. HLC is building an ever-growing database of victims, including their histories, photos, eyewitness accounts of the crimes committed against them—anything that could be discovered about each individual victim. The database is useful not only as a tool to keep the memory and identity of each victim alive—not just a number—but also as a viable source of evidence of war crimes to be used in trials. HLC also created the Kosovo Memory Book, a file designed to collect those stories of the victims during the conflict. Its intent is to keep anyone in power from altering the facts (the number of victims, for example) for any political purpose, and to create a “culture of remembrance” for those who were murdered or disappeared. They are also working on a protection program to encourage survivors and witnesses to testify. Kandic’s work with HLC, while it has garnered praise from other human rights groups, has also made her the enemy of many of her fellow Serbs (who consider her a traitor to her country) and of those in positions of authority whom she and HLC are trying to bring to account for their crimes. Death threats are a commonplace and frequent occurrence for both Kandić and her staff, as are attacks on HLC’s offices. Several of Kandic’s colleagues have been silenced by these threats; nonetheless, Kandic and HLC continue their work. Natasa Kandic fervently believes that the war crimes committed in and around her country need to be documented, preserved, and used to bring those responsible to justice. She and the Humanitarian Law Center work against very powerful people to prove their involvement in horrific war crimes, bring them to account, and oust them from power. Their work continues through the post-war era to stop human rights abuses and those responsible for them.